Ofcom has announced that it is to hold a multi-billion pound open auction for the valuable airwaves freed up by the switch to digital TV. The auction will take place in 2009 and be open to all technologies. Not only will the market be left to decide how the so-called 'digital dividend' is used, but auction winners will also be able to trade their licences afterwards. Explaining Ofcom's reasons for holding the sale in this way, Philip Rutnam from Ofcom claimed that after extensive research, Ofcom could find no reasons for prioritising one use over another. "There are so many potential uses of this resource. Our conclusion is that there is no compelling case for intervening to require the spectrum to be used for a certain purpose." It had been hoped that the bandwidth would be saved for proving HD services over Freeview. The spectrum freed-up by the digital switchover covers nearly a third of the most useful bandwidth available and will be hugely attractive to many broadcast services and technologies with many billions of pounds likely to be raised from the sale. Not only can the frequencies within the spectrum under auction travel further, they can also penetrate buildings, making them of great interest to digital terrestrial TV channels, local TV channels, Cognitive radio operators, wireless broadband and mobile television operators. 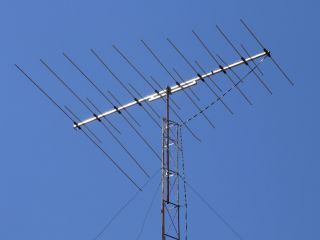 The only special provision of the auction announced so far is that much of the interleaved spectrum - the 'white space' between television transmitters ­- will be reserved for short-range wireless microphones, thus allowing concerts and events to take place unhindered.